I’m probably a bit late to jump on the band wagon here but, I’ve been to Flat Iron! I have attempted to go to Flat Iron before now, however it is one of these no reservations places that seem to take several attempts to actually get the chance to eat in. This time however we had a plan. A friend who works nearby went straight round to put our names on the list to await a call when there was a table free. The rest of us made our way over to Soho and we all enjoyed a nice drink over the road while we waited and got a seat just after 7pm. We were seated upstairs which is a small dining room with mostly bench seating, so be prepared to take a pew next to strangers. There are few separate tables at the back but presumably with the no booking policy you wouldn’t be able to secure one of these except by chance. The decor is rustic and basic with bare brick walls but there’s definitely a homely comforting vibe about the place. If steak isn’t your thing, don’t bother going to Flat Iron, it’s the only thing on the menu. 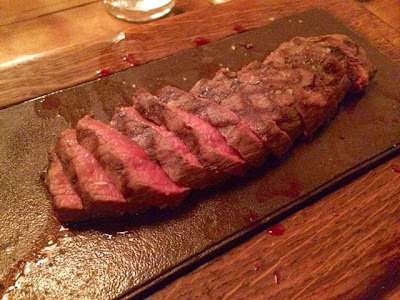 This restaurant does precisely what it says on the tin: flat iron steak. You can have your steak cooked however you like (they suggest medium rare) and it comes with a little dressed side salad. All you need to do is choose if you want sides and sauces and which ones. I had my steak medium rare with peppercorn sauce and the roasted aubergine with tomato, basil and parmesan on the side. The steak was delicious, perfectly cooked and really tender and juicy. Not even a hint of chewiness. The peppercorn sauce was nice although on reflection I think I’d have preferred the horseradish cream or the Bearnaise. I’ll just have to go back and try them! The salad was nice and dressed in some sort of vinaigrette. It was tasty and I ate it because it was there, but I probably wouldn’t have ordered it if it didn’t already come with the steak. As delicious as the steak was (and a pretty decent size at that) it is important not to overlook the sides. The baked aubergine was deliciously cheesy and totally moreish. I really liked that they offered a few different vegetable side dishes and didn’t just assume that everyone wanted chips. Having this option made it a really nice decent sized tasty meal without it having to be a stuff yourself silly occasion. Chips were of course on the menu though and, purely for blog purposes, I did pinch one of my sister’s to try. Cooked in dripping they had a definite roast dinner taste to them which was divine. I wasn’t aware that pudding was even on the cards at Flat Iron so when the waitress asked us if we’d like dessert we all answered with confused blank looks. She then explained that there was only one option which was a chocolate and salted caramel mousse. We decided to share one just to see what it was like. The waitress brought up an empty cup and what looked like a big industrial squirty cream can and dished our mousse up from this at the table. 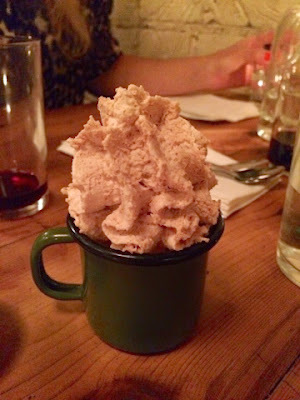 It was creamy and smooth and came with a small dish of salt to adjust the salted caramel to your own taste which was a thoughtful touch. I enjoyed the dessert and it was a nice sweet end to our meal but the novelty of the way it was presented to us was perhaps the most memorable part of the dish as the flavour wasn’t anything new or outstanding, just a nice chocolate mousse. 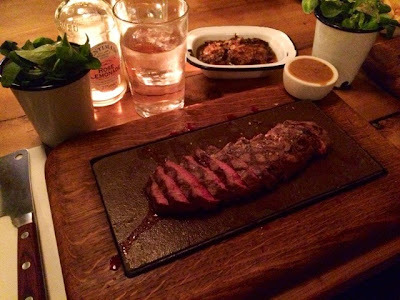 Flat Iron may be a bit of a novelty but there’s no denying that even though the grub you get may be simple, it’s done very well and at an extremely reasonable price (£10 for the steak and salad, £1 for a sauce and sides £2.50-£3.50). It may not become a regular because I don’t exactly want to eat steak all the time but I’ll be heading back as it’s one of these places you want to take people to so you can see someone else enjoying the novelties that so delighted you the first time round.